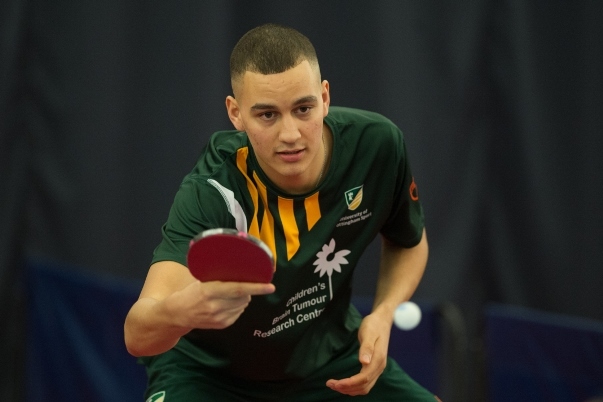 The last BUCS Big Wednesday Championship match of the day saw UoN Men’s Table Tennis 1s face UCL at 7pm in David Ross Sports Village salle. 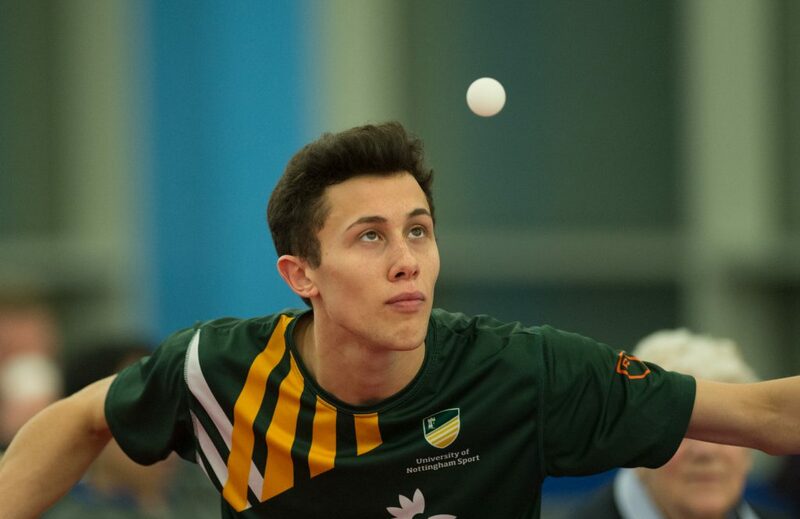 University of Nottingham entered this match as clear favourites and set out to win a fourth gold medal in a row after a convincing victories in 2017 in Bath against Nottingham Trent University. Even after recording a brilliant season which which saw the team win the BUCS Premier North league without a single defeat, UoN still knew they’d have to be at their best against a strong UCL team to avoid an upset. 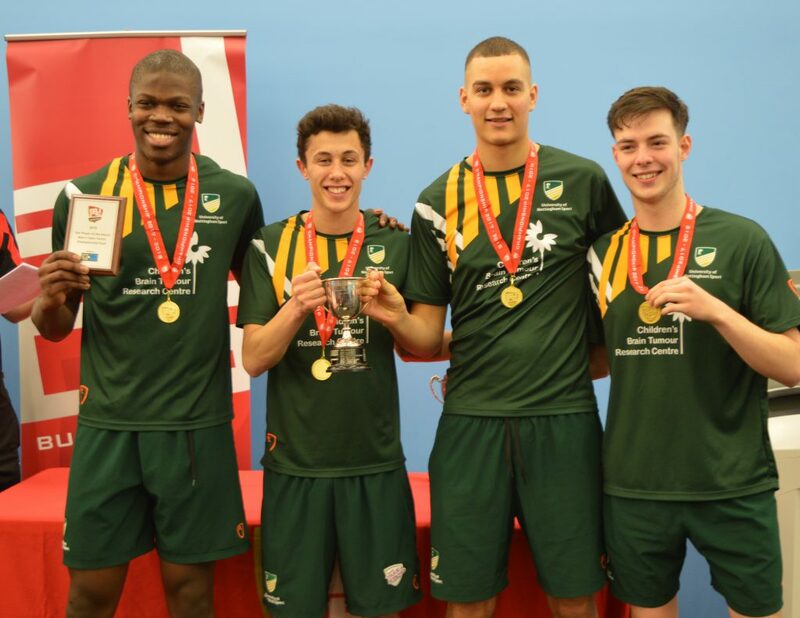 UoN had expected to face Nottingham Trent in the final as in the previous two gold medal matches. However, the BUCS Premier South champions took a narrow 9-8 victory against Trent in the semi-final, earning them a place in the Nottingham finals. Led by experienced captain Adam Harrison, the team comprising of Gabriel Achampong, Marcus Giles and Joe Pilkington were keen to make a quick start. Harrison got the match underway taking on Numayr Malik and both players looked to find their range early on. It was the captain who settled in first taking an early lead and the first set 11-6. Harrison looked comfortable in the second set and it wasn’t long before he won 11-1 and the third 11-3 putting the first points of Championship on the board for the Green and Gold. Achampong took his first game of the Championship in his stride against Tom Pang and rapidly took an 11-3 lead. The pace didn’t relent and he signed off the second set with an emphatic backhand smash across the table to win 11-1. The second UoN point of the night was on the board when Achampong comfortably took an 11-3 victory, and the match, in straight sets. Marcus Giles was up next against Tom Wong and the match got off to an odd start. In a strange turn of events, a ball had to be changed after a powerful shot from Tom Wong split during a rally. With the game ball replaced Giles carried on his assault on Wong and won the first set at a canter 11-4. He wasn’t done there and after winning the second 11-7 Giles comfortably won the third set 11-9 to win the match in straight sets and rack up another point in the singles for the green and gold. It was Joe Pilkington’s turn to get his finals underway with a match against against Pedro NG and got off to a slow start losing the first set 11-7. The score was reversed in the second set with Pilkington on top and Pedro NG missing the table with a forehand return at a crucial moment to level it up at 1-1. Pilkington’s sharp reactions set him up perfectly for a winner down the lin it was that winner that was the difference in the third set, which he won 9-11. The final set went Pilkingtons way, putting to bed his early nerves having dropped a set earlier on, winning the final game 11-5 and taking the match 3-1. There was hardly anything to separate Harrison and Pang in the early stages of the 5th match of the Championship . With the score locked at 5-5 Pang was proving a much tougher oppononent than anticpated. It was Harrison who had to up his game and respond he did, eventually pulling away and winning the first set 11-5. Harrison won the second at a canterand with the Uon Scholar now in full swing it was only a matter of time before he closed out the game, finishing 11-3 and winning in straight sets. Having faced top seed Adam Harrison in the first game, it was now Malik’s turn to take on Achampong. Unfortunately for him he faced a similar fate, with UoNs Achampong dominant from the first point. It took a matter of minutes for Achampong to get the first set on the board, winning 11-4 and setting up another straight sets victory. It was clear by this point that the result of the match was only going to go one way, but UCL brought some serious determination and grit to this match were resilient and determined to the end. Marcus Giles ‘s match against Pedro NG was extremely close right until the end in the first set. Tied at 11-11 the game went to extra points and whilst nothing separated them after a number of exchanges ,G iles eventually won 16-14 after a backhand exchange down the line. In the third set, Giles won game ball at 10-7 with a superb forehand to win 11-7 he never looked back, seeing out the game 3-1 in sets after firing through the final game 11-4. Wong was showing signs of his best against Pilkington in the first set of their singles matchup and edged a close encounter 12-10. In second, Pilkington made sure he was always ahead on the scoreboard, cashing in on Wong’s mistakes from the very beginning and he made the pressure pay winning 11-8 making and levelling the tie. Pilkington was struggling to find range but got into the groove after giving himself a few stern words and taking encouragement from his teammates. The pep talk paid off and he went on to win 11-6 and take a 2-1 lead. There was nothing to between them at 9-9 in the 4th set until lovely piece of touch play at the net from Pilkington changed the momentum of the match. Joe went onto win 11-9 and 3-1 in sets, a thoroughly deserved victory. After already going two games unbeaten this evening, Achampong carried on where he left off winning his first set against Pedro NG 10-12. Achampong, who didn’t look like losing a set all night comfortably took the second 11-5. The result was confirmed when he won the final game 11-9 and scoring another vital point for the team. His performance recording a whitewash on the night and landing him a coveted BUCS Championship Man of the Match award. Harrison hadn’t lost a set thus far and in the 10th match of the evening against Tom Wong he used all his experience against top seed T Wong, but it wasn’t to go all the captains way. 13-15 Wong took the first set 13-15 with Harrison not being helped by the celebrations of his teammates on the adjacent table following the confirmation of the Championship result after Achampong’s victory. Normal service resumed in the second set with Harrison regaining his composure and taking an 6-1 lead and going on to win the set 11-4 and level things up 1-1. Fully back on track, Harrison went on to win the third 5-11 and take the lead (2-1). To complete the victory and conclude the match Harrison won 11-8 in the final set to win Gold in the BUCS Championship Final much to the delight of the onlooking crowd. Follow all the action from BUCS Big Wednesday on social media on Twitter, Facebook or Instagram. You can keep up to date including live results and streams from BUCS Big Wednesday here.